I'm getting ready to do dod delete. Wanting to do headers with cutouts and keep as much of the stock exhaust as possible. 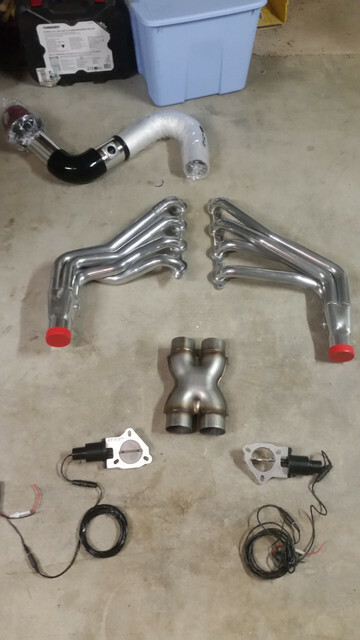 Would like to go headers to h pipe to cutouts. Anything I should be worried about with that set up? Plan in removing the oil cooler as well. Keep as much of stock exhaust as in keep your axle back mufflers or keep as much of the stock crossover section? H-pipe and cutouts would sound nice I'd think. I'm going with the PaceSetter G8 Steelies headers. Try and keep the stock crossover section. Want to go headers, H pipe to cutouts and where that ends just stock exhaust. Nice. Had pacesetter coated things on my Formula. Great budget header, I would absolutely buy them again. If you want to get cats to stay, that could get tricky mostly due to space considerations, but if off-road, I think it won't be too bad. Cutouts right before axle back bends or right after headers? G8 headers won't fit without modding it or removing the oil cooler. Apparently the SS headers are a direct install. I have bought a set but have yet to install them. I emailed improved racing for a oil cooler delete kit and about adding a cooler elsewhere. Want to keep the cats but like lastcall said not sure if there is enough room. Gnomestur wrote: I emailed improved racing for a oil cooler delete kit and about adding a cooler elsewhere. Want to keep the cats but like lastcall said not sure if there is enough room. Improved Racing can set you up with an adapter for oil cooler lines, so you can add an air/oil cooler. You may be able to just get that adapter, and use plugs for now, but am not certain if you have to bypass the oil cooler adapter thermostat somehow, or not. They should be quite helpful with that project. Suggestions on heat shields for the intake?